Grade 6 Science | Ms. Rose's 5/6 Adventure!!!! 1. Living or Non Living? The Seven Characteristics of Living Things. See the Open Door Web Site and the Corresponding Online Quiz. 2a). Recognizing the Five Kingdoms: This page provides a quick and clear definition and the characteristics of each Kingdom. 2b) The Five Kingdoms Powerpoint Website: This website provides clear information about Kingdoms using a variety of powerpoint presentations with quiz questions for review. 3. Understanding the Animal Kingdom at pppst.com : Here is a great website with windows to different websites and many powerpoint presentations on so many different aspects of this topic. 4. Understanding Invertebrates: Explore the world of invertebrates at this website. Create a chart with the major categories of invertebrates. Find examples for each by exploring this site. This page will also lead you to pages on Vertebrates, as well as a fantastic Index Of Films On Animals of all kinds. 5. Understanding Variation: Go to the BBC Bitesize website and work your way through the 3 pages on Variation. Read about Grouping Living Things and Using Keys. Then try the games and the quiz. Write a response in your Reading Journal to explain how using these activities helped you understand one or more of the Big Ideas of the Biodiversity Unit. 6. EcoKids Games and Stories: Demonstrate your understanding of the Big Ideas of the Biodiversity Unit by playing the games and doing the activities at the EcoKids Site. Each has has a different message. Can you find the main idea and explain it in your own words by referring directly to the important facts or events? Investigate and play The Great Frog Dilemma as well as the other Junior Games in the Wildlife section of the site. Sam’s Vacation is another “must do” from the Land Use section of the site. Finally, be sure to go to the Water section of the site and play Acid Lake. 7. BBC Blue Planet Challenge: Are you ready for a challenge? Try the games at the BBC Blue Planet Challenge. Report back in your Reading Journal how your experience helped you understand one or more of the Big Ideas of the Biodiversity Unit. Use specific information from your experience to back up your point of view. You can expand your experience at Web of Life, another part of the amazing BBC website. 8. Tree of Life Web Project: This is a fascinating and very complete website that allows you to trace where on the amazing tree diagram of Living Creatures a particular organism belongs. Go to the Home Page. Hold your cursor over one of the pictures on the tree and you will see that it is a symbol for one of the Five Kingdoms. Click on it, and you will enter that Kingdom and begin a journey to discover organisms that belong to it. 9. Films and photos on endangered species are available at Arkiv. 10. Arthropods: Find out more about Arthropods at Globio Glossopedia. 11. Invasive Species: Discover how plants and animals are invading the Great Lakes at Nab the Aquatic Invader. 1. There are many types of plants and animals. Even within one species there are variations. All organisms, including plants and animals, belong to one of the Five Kingdoms. Each Kingdom can be subdivided into other groups. For example, in the Animal Kingdom there are Vertebrates and Invertebrates (creatures with backbones and without backbones). in the family of Vertebrates there are fish, birds, reptiles, amphibians and mammals. By having more than one type of a species nature protects itself from extinction. An example is the banana tree. There are several different types of bananas. At present, many banana plantations of the largest variety of bananas have been infected with a “blight” (disease) which prevents fruit from properly maturing. Smaller varieties of banana trees, though, have not been affected by this disease. If the larger variety of bananas is wiped out and becomes extinct, thanks to the “diversity” (variety) of living things, other types of bananas may still survive, and the food chain of creatures that depend on bananas may be preserved. 2. 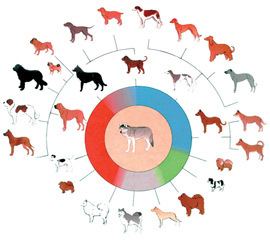 Many organisms have common ancestors. We can show how organisms have similarities within a “family” of creatures. We can identify the physical traits that cause the “branches” and unique creatures in the “web of Life”. Tree diagrams are a way to display this information. By using the ROM kit, we found similarities and differences between millipedes and centipedes by examining the number of legs they have. “Milli” is a prefix that comes from the French word for a thousand and “centi” comes from the French word “cent” which means one hundred. Centipedes and millipedes are different from insects. They belong to a class of organisms called Myriapodia. Myriapodia means “having many legs”. We compared the Horsefly and the Hoverfly with Honey Bees and Ants. The Hoverfly and Horsefly have one set of wings and 6 legs, but the Honey Bee and the Ant have 2 sets of wings and 6 legs. All these flying insects have similarities and differences. The Honey Bee and the Ant are similar because they both have 6 legs, but they are different because the ant is very small and walks on the ground, and the Honey Bee flies and is much larger. When we compared a Daddy Long Legs with the Common Garden Spider, we noticed that the Common Garden Spider had 2 main body parts, but the Daddy Long Legs had only 1 main body part. 3. Food chains help us understand how groups of creatures and organisms will be affected if even just one of them dies out or suffers a loss in numbers. The food chain will be disturbed if one of the species lower down on the chain dies. The animals which depended on this food will not thrive (do well), and might even die out. Also, if a predator disappears, the population of its prey will rapidly increase. Animals which used to be “in balance” can become a problem to the ecosystem in which they live, overrunning it and even consuming all the food on which they depended … even causing their own starvation! 4. 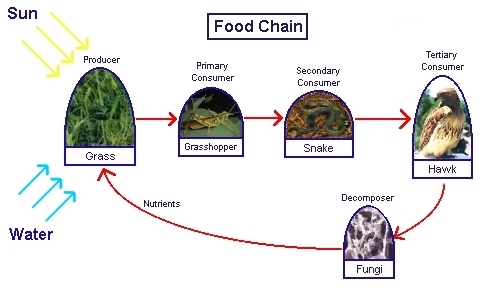 Human Activities can negatively impact on Food Chains and Food Webs. We can destroy ecosystems and endanger Biodiversity. When we build many buildings there will be fewer plants for animals like shrews to eat. The population of shrews will diminish, and the food supply for animals that eat shrews will also diminish. One way that we can reduce our negative impact is to stop building roads that cut across the migration paths of animals. We can also put up animal crossing signs across roads that cut through migration routes. Driving with headlights on can also help prevent killing animals on our roadways. The basic concepts underlying flight depend on the Properties of Air. A property is another word for a characteristic. 1. Air takes up space: proof … you can trap air in a bag and see that it fills the bag. 2. Air has weight: You saw an experiment in which two balloons were inflated and balanced on a rod. When the air from one of the balloons escaped, the side with the inflated balloon was clearly heavier. 3. Air exerts pressure: You saw an experiment in which a glass of water was inverted over a piece of cardboard. When the glass was inverted, the air below the cardboard was able to support the cardboard, water and glass so that the water did not come out of the glass. 4. Air can be compressed: You can use an air pump to squeeze more air into a tire. 5. 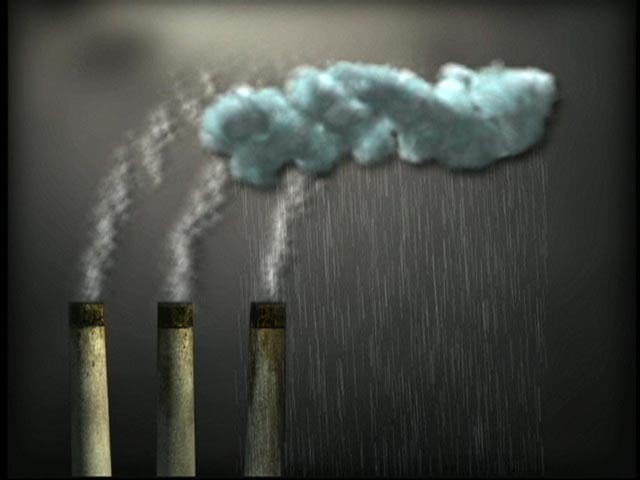 Air pressure varies with altitude: The higher the altitude, the thinner the air, and the less pressure it exerts. At sea level, the air pressure is greater because more air is weighing down on us. 6. Air expands when heated: If you cover the mouth of a plastic bottle with a balloon, and then place the balloon in a basin of hot water, the air inside the bottle expands and inflates the balloon. Hot air balloons work on this principle. Watch the YouTube video of experiments that demonstrate the Properties of Air. Watch the video we saw in class again to review how moving air exerts low pressure and how the construction of an airfoil can create a difference in air pressure below and above the wing of a plane. Two other concepts that affect flight are “pitch” (the rising and falling of the nose of the plane) and “yaw” (the side to side movement of the plane. The construction of an airplane must include features that stabilize the plane such as the tail and the wing tips. Watch an explanation of flight at Mysciencesite.com. 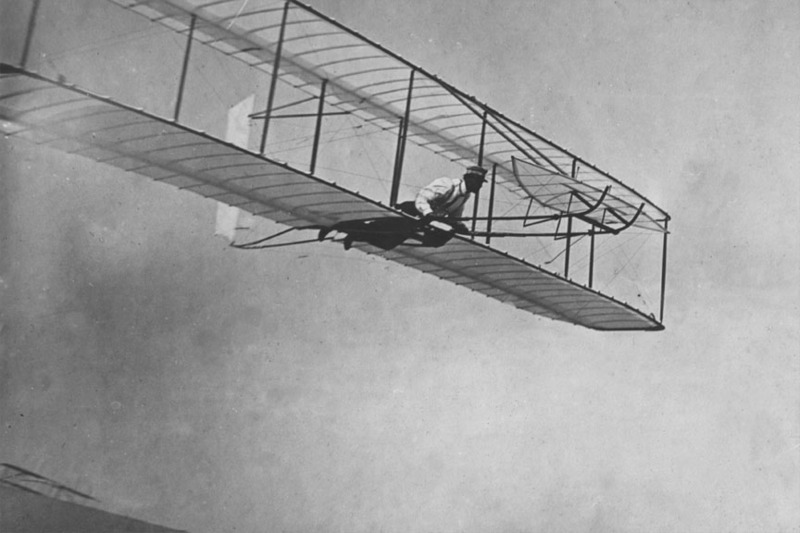 The Wright Brothers: Review how the Wright Brothers solved their problems about flight at the NASA Getting it Wright. There are many podcasts that you can download in addition to the ones that we watched at this page. Use Plane Math for lessons and activities on the Four Forces of Flight and explanations about how things fly. Read and do the activities for Beware of the Energy Vampire, Fun Games to Play, Videos and Energized Guy. For each one … write a journal response on what you learned. The atom is the smallest unit of matter. Protons: are tiny particles in the central part of the atom (the nucleus). Protons have a “positive charge”. Electrons: are tiny particles that orbit around the center of an atom. They have a “negative charge”. 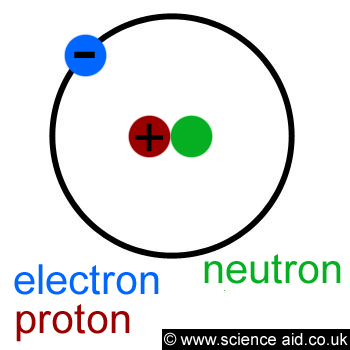 Most atoms have an equal number of protons and electrons, so they have a “neutral charge“. It is possible for electrons to become detached from their atom. If this happens, there are more protons than electrons, and we say that the atom has a“positive charge“. The atom will try to become balanced and attract or capture the number of electrons that it is missing.In other words, opposites attract. A positively charged body will be attracted to a source of negative charges. When electrons flow from one place to another, this causes a “current“. A current is just another word for a “flow” of electrons. If you are in the path of the current, you will feel a shock. This is what happens when you drag your feet across a carpet and then go to turn on a light. You may lose electrons by dragging your feet, so when you turn on the light switch or touch anything that conducts electricity, your body will try to attract electrons to replace those that you lost. You will be part of the path of the flow of electrons … and in this case you will feel the shock of “static” electricity. Conductor: a material that electricity can flow through (such as metal or water). Insulator: a material that electricity does not easily flow through (such as plastic or wood). Electrocution: When a dangerous amount of electricity flows through a body, this is called “electrocution”. Large amounts of electricity can kill or “electrocute” a person. 1. Know the symbols for building circuits. Review them by playing the games at the Woodland Electricity Teaching Resources site. Take the quizzes and tests!! 4. Understand the difference between insulators and conductors. 5. Know some of the different types of switches and applications for their use (e.g., pressure switch, toggle switch). 7. What is a battery? What are the basic components and what happens when they are connected? 8. What is a hand generator? Why does it work?